Today, I want to share the Sector Rotation Back Test application (code at GitHub). This is the last application in the series of examples (I have shared 5 examples) that will demonstrate the amazing Shiny framework and Systematic Investor Toolbox to analyze stocks, make back-tests, and create summary reports. The motivation for this series of posts is to show how to translate, with minimal effort, your back-test scripts into live web applications that can either be run from the Shiny server or your personal computer. Please note that Back Test applications take longer time to update the plots/tables and hence maybe more appropriate to run from your local computer. Today, I want to share the Market Filter Back Test application (code at GitHub). This is the forth application in the series of examples (I plan to share 5 examples) that will demonstrate the amazing Shiny framework and Systematic Investor Toolbox to analyze stocks, make back-tests, and create summary reports. I will post the next example application on Monday. Today, I want to share the January Seasonality application (code at GitHub). 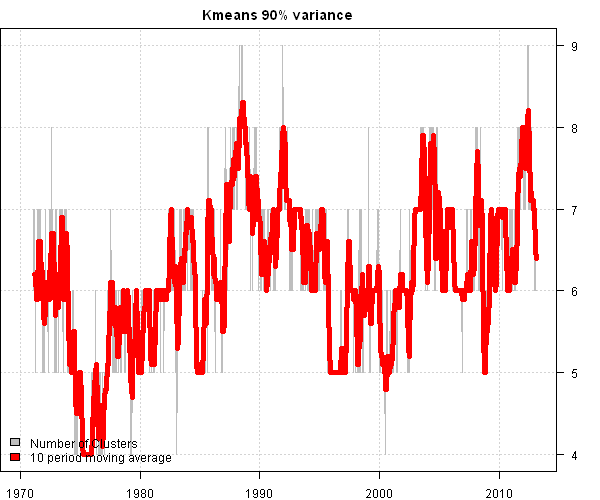 This example is based on the An Example of Seasonality Analysis post. This is the third application in the series of examples (I plan to share 5 examples) that will demonstrate the amazing Shiny framework and Systematic Investor Toolbox to analyze stocks, make back-tests, and create summary reports. I will post the fourth example application tomorrow. Today, I want to share the Multiple Stocks Plot application (code at GitHub). This is the second application in the series of examples (I plan to share 5 examples) that will demonstrate the amazing Shiny framework and Systematic Investor Toolbox to analyze stocks, make back-tests, and create summary reports. I will post the third example application tomorrow. Today, I want to share the Single Stock Plot application (code at GitHub). This is the first application in the series of examples (I plan to share 5 examples) that will demonstrate the amazing Shiny framework and Systematic Investor Toolbox to analyze stocks, make back-tests, and create summary reports. I will post the second example application tomorrow. 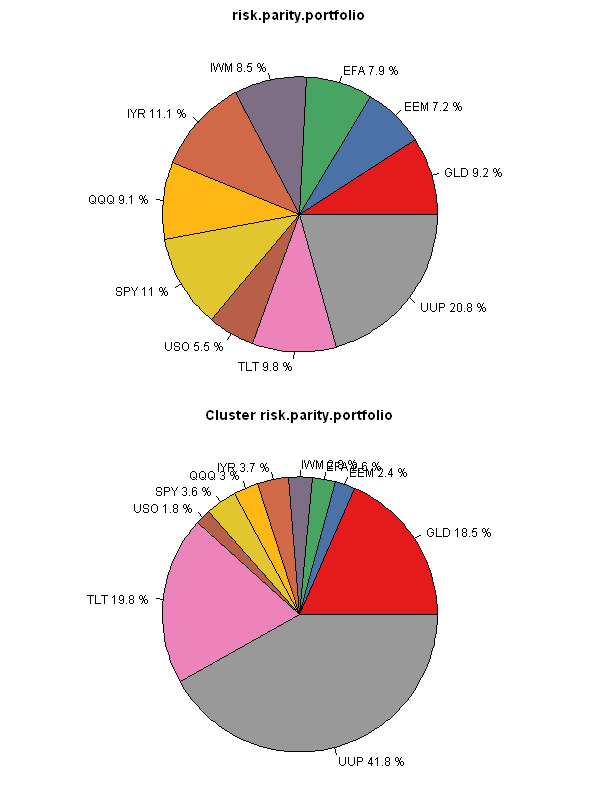 Today, I want to continue with clustering theme and show how the portfolio weights are determined in the Cluster Portfolio Allocation method. 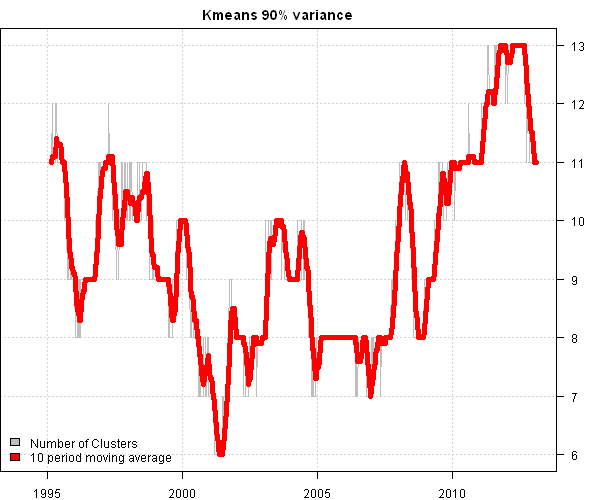 One example of the Cluster Portfolio Allocation method is Cluster Risk Parity (Varadi, Kapler, 2012). I will illustrate below all 3 steps using “Equal Weight” and “Risk Parity” portfolio allocation methiods. Let’s start by loading historical prices for the 10 major asset classes. 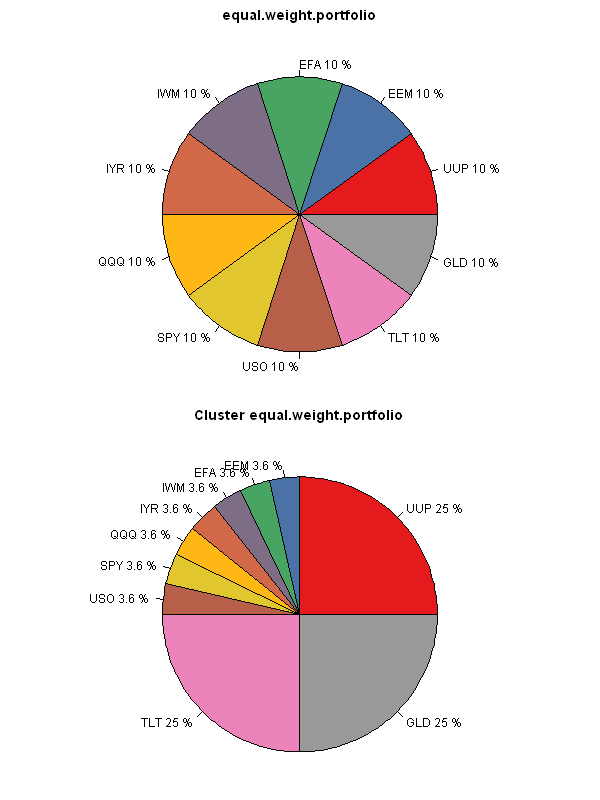 The difference is most striking in the “Equal Weight” portfolio allocation method. The Cluster version allocates 25% to each cluster first, and then allocates equally within each cluster. The Plain version allocates equally among all assets. The “Risk Parity” version below works in similar way, but instead of having equal weights, the focus is on the equal risk allocations. I.e. UUP gets a much bigger allocation because it is far less risky than any other asset. Next week, I will show how to back-test Cluster Portfolio Allocation methods. To view the complete source code for this example, please have a look at the bt.cluster.portfolio.allocation.test() function in bt.test.r at github. In the Tracking Number of Historical Clusters post, I looked at how 3 different methods were able to identify clusters across the 10 major asset universe. 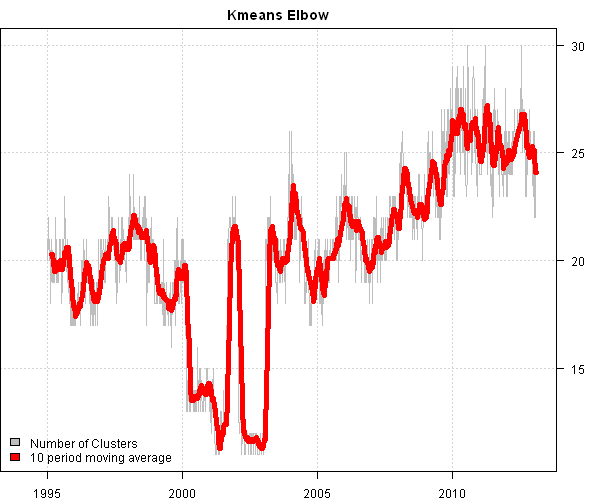 Today, I want to share the impact of clustering on the larger universe. 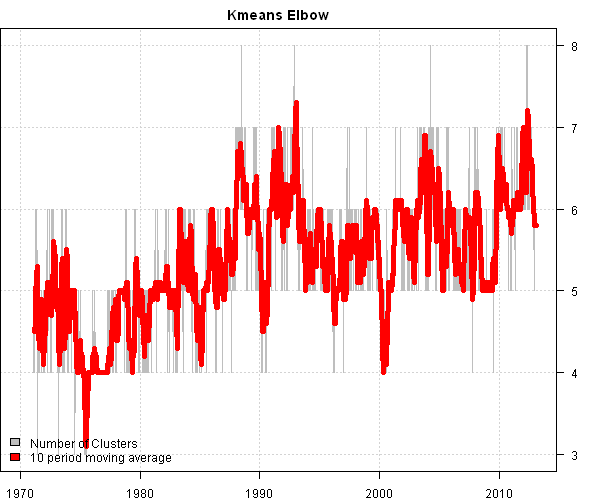 Below I examined the historical time series of number of clusters in the DOW 30 and S&P 500 indices. I went back to the 1970 for the companies in DOW 30 index. I went back to the 1994 for the companies in S&P 500 index. Takeaways: The markets are changing, and correspondingly the diversification (i.e. 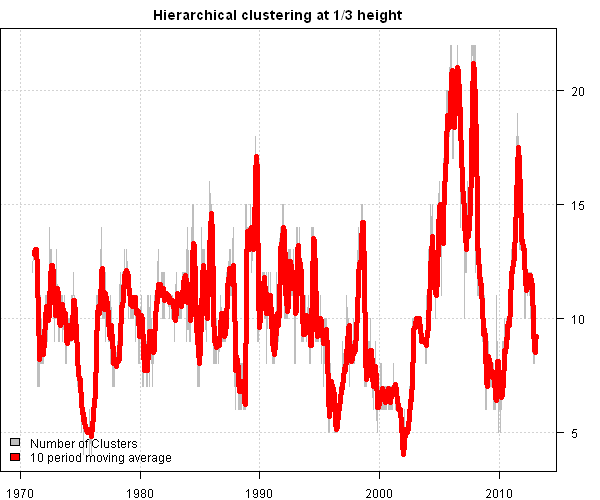 number of clusters) goes thought cycles as can be seen in the charts. The results will vary across different methods and must be validated by the user. 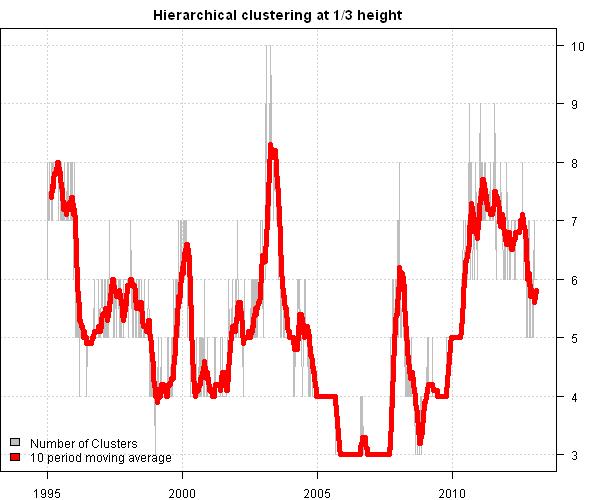 For example, some readers will consider an average of 10 clusters for S&P 500 as too small, while others might think that 10 clusters as sufficient.